Music lovers were treated to an afternoon performance for Arts at the Cathedral in Owensboro. 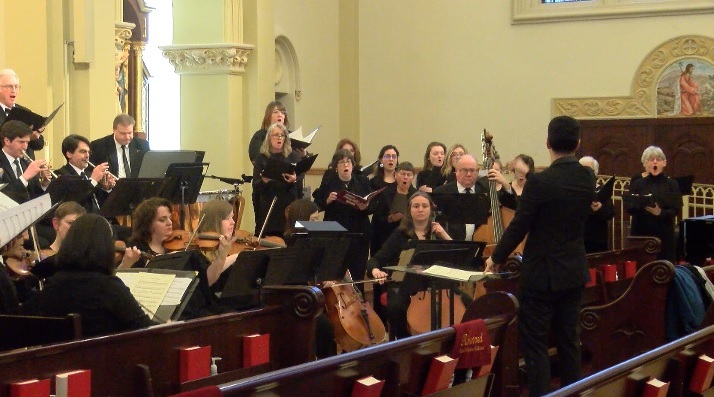 The Owensboro Symphony Chamber Orchestra and Chorus returned to the St. Stephen Cathedral Sunday for the fifth year in a row. The performance is part of the St. Stephen Arts at the Cathedral series. The chamber orchestra and choir performed a variety of classical works in front of a large crowd. Performances included Handel’s “Overture” and “The Rejoicing” from ‘Music for Royal Fireworks’, Alan Shulman’s “Ben Franklin Suite” and William Walton’s “Touch Her Soft Lips and Part” from Henry Suite. The Owensboro Symphony Chorus is a group of 80 students, college faculty and members of the community. Donations were accepted to benefit the Arts at the Cathedral.